Drivers heading south to Florida from the Midwest in January 1999 may have noticed a strange looking vehicle on the highway. From the front, it looked like a Lincoln LS. From the rear, it looked like a Mustang. 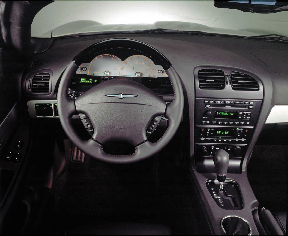 In reality, it was the first—and one of the few—physical test models of the 2002 Ford Thunderbird. While working out their design concepts for resurrecting the T-Bird nameplate, Ford engineers had patched together a combination Lincoln LS/Mustang to test a principal element of their plan: to use the LS platform and powertrain so they could share components with the larger car and ease their design efforts. The long ride would give them a real-world feel for the interaction of the body and chassis. "Dew" was the internal code name for the LS, so they called the test car the "Dew Tang." The Mustang was along for the ride because the rear body shell was to be a convertible, as is the Mustang, and it fit on the chassis. Everything on that test ride checked out fine, and the ugly-duckling Dew Tang morphed into a swan. In fact, says Ford, the T-Bird convertible roadster that emerged from engineering was so appealing that by November 2001, all 25,000 in the initial production run had been sold. Two hundred that were made especially for the Niemen Marcus Christmas catalog were gone in a matter of days. Ford plans to sell the Thunderbird in Japan as well as the U.S., but probably not until 2004. There are no plans yet to sell it in Europe. But the most interesting aspect of all may well be the design process itself: While recreating an icon from the past, Ford engineers helped point the automaker to a digital future by engaging in one of the most software-intensive design efforts in the company's history. "We pushed the limits of CAE (computer-aided engineering)," says Nancy Gioia, chief engineer for the car. In fact, they pushed the limits beyond Ford's walls. The Thunderbird development program saw Ford's tightest integration yet of suppliers: The company opened its internal design database to them, while co-locating many at its offices to facilitate collaboration. The digital car. Discontinued in 1997 for declining sales, the original Thunderbird debuted in 1955, the result of four years of design planning. Ford at the time called it a luxury car, but Motor Trend magazine insisted it was a sports car, and the label stuck. 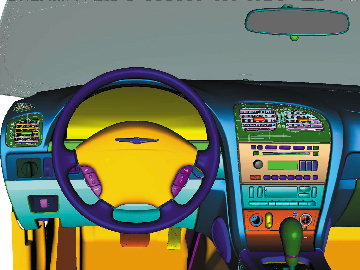 CAD view of the interior shows how the look and aesthetics Ford tried to achieve for the driver's compartment. In typical 1950s fashion, the original designers produced full-size airbrush renderings of the various concepts for the car and mounted them so their colleagues could view them as if the cars were on a highway. But that was then. Engineers working on the 2002 model traded in their predecessors' airbrush renderings for CAD screens. There is nothing unusual about that, of course. All U.S. automakers are aggressively pursuing digital-design strategies. DaimlerChrysler claims to have produced the first "paperless" car, the LH platform, in 1997 using CATIA software from Dassault Systemes. With the 2002 Town and Country, the company for the first time used its software initiative to lay out the assembly-plant floor. General Motors has an extensive math-based synthesis-driver vehicle-development process centering around Unigraphics software from EDS PLM Solutions. But Ford has seemed to hype its digital initiatives—C3P, for CAD/CAM/CAE/PDM—more than most. Software vendors crawled all over each other a few years ago to earn the right to be the centerpiece of C3P. SDRC (now, ironically, owned by General Motors supplier EDS PLM Solutions) with its I-DEAS® Master Series. Engineers, tier-one suppliers, and software vendors alike have been closely monitoring progress in the C3P initiative ever since, and the program has been a favored topic at several software conferences. I-DEAS for CAD, Metaphase and Team Data Management for PDM, and EAI for visualization, all from EDS. MSC/Nastran, ANSYS, and Altair's Hypermesh for analysis. Mechanical Dynamics' ADAMS for kinematics. Ford calls the integrated software model the "Digital Buck," and they used it for everything from concept development to checks for clearances and interferences and setting up manufacturing tools. The result: a 24-month sprint from design to manufacturing with a minimum of physical prototypes. In fact, says Gioia, the Digital Buck to let the team achieve 95% production tooling on the first prototype, vs. the usual 10-50%. Part of the reason for that was the opening of Ford's design database to the suppliers, who used I-DEAS and a special interface to share their electronic files with Ford engineers. Most OEMs who share CAD files do so through a neutral mailbox that engineers on the receiving end have to enter to check files in and out before they work with them. "With the I-DEAS-Metaphase interface we set up, suppliers could access the Ford database directly, which saved a lot of time," says Steffen Mueller-Urbaniak, Ford's manager of digital build and knowledge-based engineering. Speed wasn't the only benefit from the software. The opportunities the software provided for continuous tweaking of the design without endangering the launch date were just as important. "We used the analysis tools to do a hundred different iterations on eliminating noise, vibration, and harshness so we could get it right," says NVH Supervisor Ron Ziegler. That's more NVH design iterations than engineers have done on any other Ford. Still, adds Gioia, the software actually helped engineers cut time and cost out of the design process. The looking glass. The value of extending the C3P computer initiative to bring vendors into the design loop paid off handsomely in virtually every phase of the design process, but none more so than with the windshield. Engineers wanted a steep angle for the windshield to cut down on top-down turbulence. Also, the Thunderbird windshield is the first to combine an extreme depth of bend and an A-pillar wraparound. Those features give it the most complex geometry of any windshield in the auto industry, according to PPG, the glass supplier that designed it. Engineers say the extensive use of software in the Thunderbird program puts the automaker on the road to a complete digital future. Points of view. Windshields, of course, are for looking in as well as looking out, and reports from those looking in—the buyers—are that the view is great. Joe Kaminkow, vice president for engineering design at International Game Technology in Reno, NV, liked what he saw so much that he bought three of the Niemen Marcus-edition T-Birds, one each for his wife, his in-laws, and his father. "Dad feels like a celebrity in the car," he says. "Other drivers pull up just to look in." Kaminkow predicts the Thunderbird will do for Ford what the Viper did for Dodge—reinvigorate its engineers while restoring its reputation for producing exciting cars. Buffalo lawyer Joseph Grasmick can attest to the excitement part. He drove his new T-Bird to Miami. When he pulled into a shopping mall parking lot, a group of teenagers did a spontaneous 15-second dance on seeing the car. "It's been a long time since I connected with that age group," he says. Chief Engineer Gioia's Uncle Harry would have identified with Grasmick and the teenagers. "He owned a 1966 model," she says, "and he told me when I was a kid that the essence of the Thunderbird is freedom." Gioia asserts that it still is. Freedom: Not a bad attribute for something Ford calls an American icon. Coefficient of drag. Convertibles have a bit more drag than cars with roofs. Software trials with their own internal Corporate Vehicle Simulation Program showed engineers they could use a 3.58 axle-gear ratio, instead of the 3.31 on the LS, and improve their 0-to-60 mph performance with only a slight degradation in fuel economy. They also chose a special tire, the Michelin Pilot HX MXM4 P235/50 R 17 95V, which further counteracted the drag and gave them the ride and handling they wanted. Vehicle weight. The engineering team brought the car in at 41 lbs under its upper weight limit. Software showed engineers they could do that by making the wheelbase seven inches shorter than that of the Lincoln LS. Ride dynamics. Using the Digital Buck, engineers tuned the shocks, shock mounts, springs, stabilizer bars, rubber components, and steering gear to improve the ride. To increase damping for low-speed tuning control, they opted for a 32-mm-bore shock rather than the 30-mm shock on the LS. NVH. 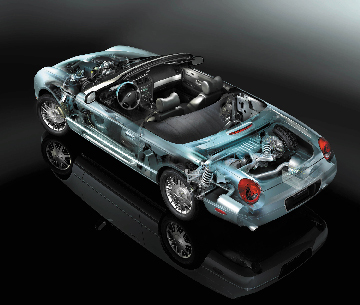 To get back the body stiffness they lost from the LS when they opted for a convertible design, they made extensive use of their suite of analysis software to find the right solution. The best alternative, they learned, was to incorporate three X braces, one each below the engine compartment, at mid-car, and at the rear. They also added a cross beam that starts from behind the seats and runs right to left. Engineers also used the computer to find the noisiest parts of the body so they could increase the density of sound-absorbing material. For example, they used laser holography to map floor-pan vibrations, and added mastic only where needed to save cost and weight. Body parts (hood, deck lid, fenders): Budd Corp. Lighting: North American Lighting Corp.